This is a fully functional Expert Advisor. It is intended for trading major currency pairs with small spread. 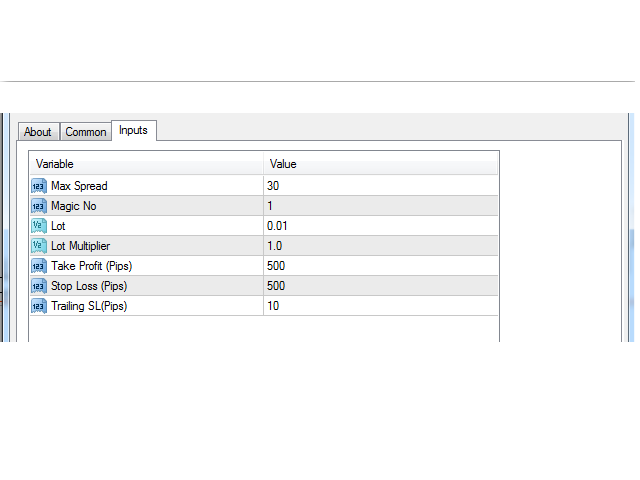 It uses scalping technique for quick profit and easy to use with simple input parameters. Max Spread: maximum spread allowable for trading. Magic No: unique expert number. Lot Multiplier: size of subsequent lot by multiplication. Take Profit: take profit in pips. Stop Loss: stop loss in pips. Trailing SL: trailing stop in pips. * zero divide error has been fixed.